I found it difficult to review slow cooker cookbooks. Perhaps it's because I have the idea in my head that slow cooker recipes should be quick and simple, almost as if by magic a healthy and delicious meal should appear on my plate with no effort at all. The fact of the matter is, all good, healthy meals do take some kind of time. If it's not the time spent just before dinner is served, it may be the time spent getting a slow cooker meal ready early in the morning or the evening before. If I can reconcile myself to investing a little bit of time in a slow cooker meal, then there are some lovely cookbooks to make use of. 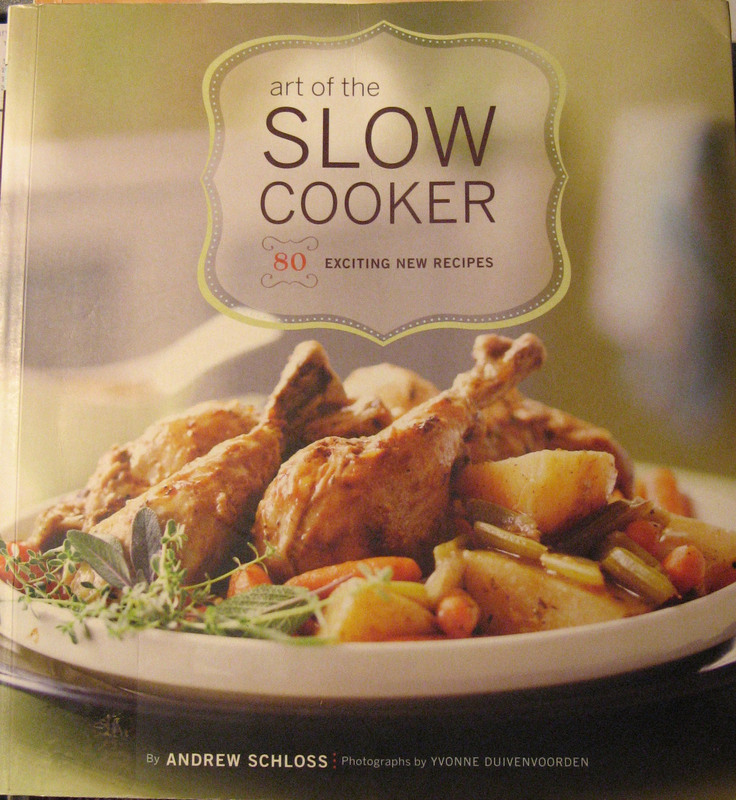 The Art of the Slow Cooker by Andrew Schloss was the book I chose today's recipe from. It is a relatively new book, well laid out and filled with good pictures. The book contains 80 recipes divided between soups, stews, braises, classics, vegetables and sweets. You will find some outside-the-box recipes such as Chocolate Chicken Chili Soup and Espresso Braised Beef as well as classics such as Chicken Cacciatore and Herby Minestrone. The cookbook is definitely aimed at people who like gourmet-type recipes, made with whole foods and no shortcuts. Many of the recipes are the type I would use on the weekend, rather than for a simple weeknight meal. 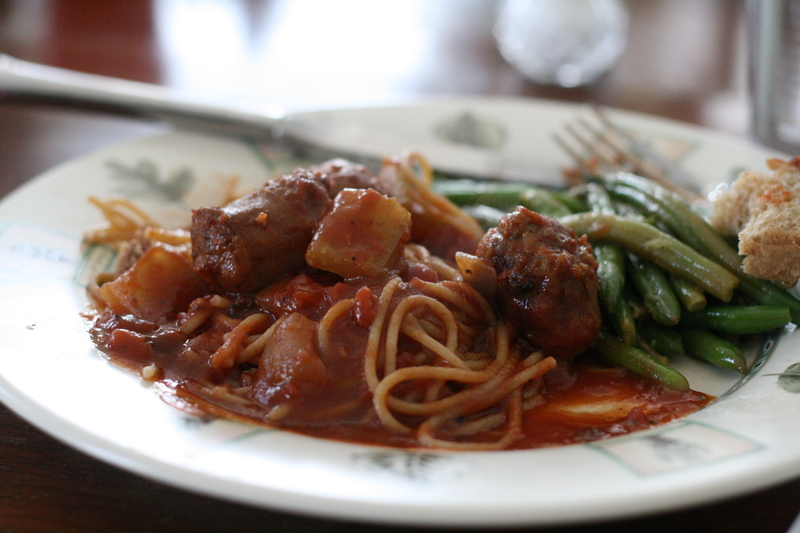 I chose to try the Sausage and Tomato Ragu with Pasta. We all thoroughly enjoyed this meal and will look forward to having it again sometime soon. Heat the oil in a large deep skillet over medium-high heat. Brown the sausage on all sides, about 2 minutes per side, then transfer to a 5-to-6 quart slow cooker. Add the onions, celery and carrots to the oil remaining in the skillet and saute until lightly browned, about 4 minutes. Add the garlic, rosemary, allspice, salt, and pepper and cook for another 30 seconds. Add the flour and stir until incorporated. Add the wine and bring to a boil. Add the broth, crushed tomatoes, and tomato sauce and stir to incorporate, scraping up any browned bits from the bottom of the pan to blend them with the sauce. Heat to simmering and pour over the sausages. (At this point I put the ragu in the fridge for the night and place it in the slow cooker in the morning.) Cover the cooker and cook for 4 to 5 hours on high or 8 to 10 hours on low. Cook the pasta in rapidly boiling, lightly salted water until tender, about 10 minutes; drain and serve with the ragu. 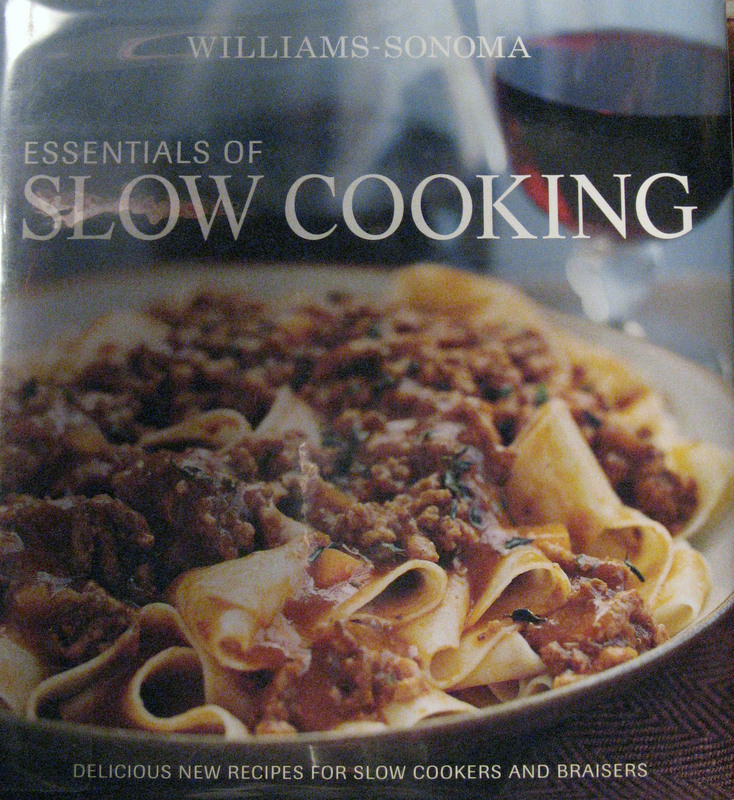 I also enjoyed perusing the Williams-Sonoma Essentials of Slow Cooking: Delicious New Recipes for Slow Cookers and Braisers. As with any Williams-Sonoma cookbook, this is a high-quality, beautifully designed cookbook. The introduction covers slow-cooking basics and prepares the way for the recipes contained in the book, including giving sample meal menus. The book covers vegetables, seafood, poultry, pork, beef & lamb and basic recipes. I would say this cookbook tends even more toward the gourmet cook with such recipes as Savoy Cabbage with Pancetta, Celery Root with Chestnuts, Braised Artichokes, Braised Dug Legs with Port and Figs, and Thai Red Curry Beef. However, there are plenty of more down-to-earth recipes like Texas-Style Beef Chili, Italian Pot Roast, Beef Stroganoff with Mushrooms, and Spanish Chicken Stew. Once again it is a book I would use for weekend cooking more than everyday. I was actually disappointed in the recipes from the Williams-Sonoma cookbook. The few recipes I tried did not turn out like the picture (which is not normally the case when I cook), and I ultimately questioned if they left out some instruction or ingredient. Several of the other recipes I looked at contained typos which led me to question the editing process. That being said, I didn't cook through the entire cookbook, but definitely felt it was not worth owning and was glad I had merely checked it out from the library. I don't have the book here at the moment, so unfortunately I can't give specifics. I only made one recipe from the WS cookbook, but from that experience, will agree with you, Betsy. The recipe had very good flavor, but the cooking time was so short that it left the meat (in a stew/pot pie type recipe) still quite chewy rather than melt-in-your mouth tender. I decided not to post the recipe, but I did enjoy looking at all the pictures and being inspired by new combinations. I love using my slow cooker and have checked out numerous cookbooks from the library with recipes for it. The best one I found was The 150 Best Slow Cooker Recipes by Judith Finlayson (her vegetarian slow cooker book was also great). Her recipes are not as simple as some which only require dumping all the ingredients into the cooker. Most require browning meats and the aromatic vegetables, but I've found them all to be very worth the effort. I also agree with you about the Williams-Sonoma book. I was quite underwhelmed with it, and I've loved some of their other books.